I am in Norway. Not surprisingly, this is a place where Norway spruce (Picea abies) dwells. Another place where Norway spruce grows is on the main road near my house in the Pacific NW, along my favorite jogging route. Norway spruce has been widely introduced in North America, including in the Pacific NW. In North America, people plant Norway spruce for landscaping and, in some areas, timber plantations. A friend in Norway told me that, in Norway, people plant Sitka spruce (Picea sitchensis) for the very same reasons. Sitka spruce is native to the temperate rain forests of the Pacific coast of North America only. People began planting it extensively in Norway about 100 years ago. Yesterday, wandering in the woods here in Norway, my wife and I came across an extensive stand of Norway spruce and Sitka spruce growing shoulder to shoulder. The two species were mingled apparently randomly, with Norway spruce being twice as numerous and Sitka spruce being about 50% larger in diameter and height. The stand appeared to us to be 50-75 years old. (2) seeds (which are winged) drifted there from some other nearby Sitka spruce and grew without human assistance. I do not know which is correct. If the latter, Sitka spruce would be naturalized, at least in one particular forest in Norway. In either case, seeing the two species side by side made it easy to tell them apart. First, Norway spruce have the longest cones of any spruce. They are 4"-6" / 10cm-15cm long. In comparison, Sitka spruce cones are 3" / 8cm long. 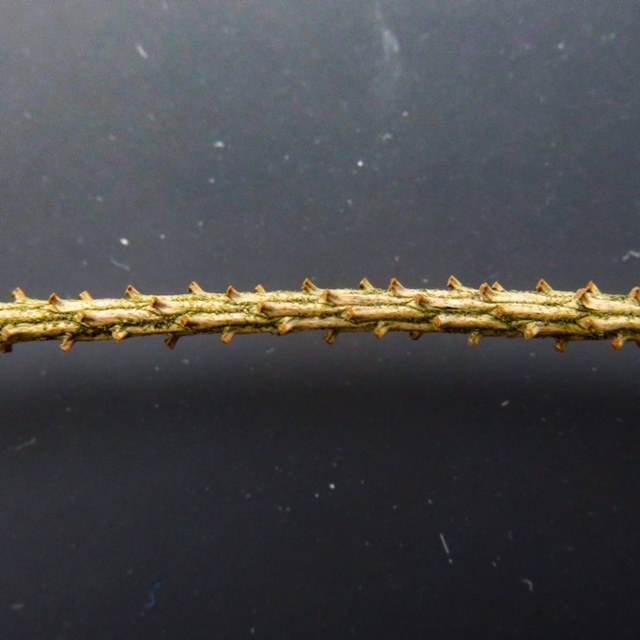 Second, Sitka spruce needles stick out from the twig at nearly a 90° angle. They are 1" / 2.5cm long, stiff, and sharp. Try putting your hand around a twig full of needles. It hurts! In comparison, Norway spruce needles are half that length, angled forward, and not sharp. The needles are not prickly to the touch. The branchlets droop toward the ground. Third, Sitka spruce needles are covered with bands of white stomata (microscopic pores). These bands are particularly prominent on the underside of the needles. As a result, the undersides look almost white or bluish-white. In comparison, Norway spruce needles do not have prominent bands of stomata. The tops and bottoms of the needles look about the same. Each needle is attached to the twig by a short woody peg. The woody pegs are durable. The pegs are visible on living twigs and even more visible on dead twigs in the tree or on the ground. Look for them!